It is a belief that this world can, and must, be conquered for Christ by militant action undertaken by the Christian Church. To get a good sense of what is happening in the established Church today see the article Dominionism and the rise of Christian Imperialism by Sarah Leslie. 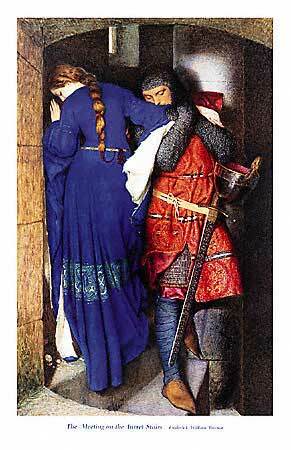 This is an old story going back to the Crusades and steeped in the Arthurian legends. The fiery zeal for the cross is being magically transformed into a bloody sword. Is this the ultimate calling of Christ? What did the angel Gabriel tell Zechariah? See Zechariah 4:6. What did Jesus say to Peter about taking up the sword in His name? See Matthew 26:52.
Who ordained churchmen to dupe Christians in this terrible way? And why are these latter day 'five-fold ministry' churchmen going in the way of the warrior monks and presuming upon God for an enforced dominion like this? Why are they calling upon Christians to "ride" with them and to dominate the world under this latter day corrupted ecclesiastical leadership? Is there any scriptural basis for this? What does the prophet Daniel say about the destiny of those saints who go out waging war in the latter days? See Daniel 7:21. And what was the Apostle John told about the military campaign of the saints against the Antichrist? See Revelation 13:7. Is it possible that Christians intent upon the Kingdom Now will be deceived or compromised into religious harlotry as they go out on their quest for a global takeover before Messiah returns? Will many Christians wake up one day to realize that their bid for forceful dominion has actually driven them into compromise and now they are in collusion with the very "god of forces" of the Antichrist himself? Is this the quintessential story of 'Beauty and the Beast'? What did Jesus have to say about this? See John 5:43. Just what will happen to carnal Christians as they ride out on this "last crusade"? Do they know how this campaign will end as they gather at Megiddo? And just who will be the people sown into the ground in the Valley of Jezreel? As usual, the poets, the artists, the songwriters are way ahead of the theologians and religious leaders. Sad to say, the artists are more faithful in their work than theologians are faithful to God. See Jeremiah 23:1,2,3,&4 and Ezekiel 34:1,2,&10. They are artists first and foremost. So typically they do not know what their art means. Nor are they inclined to explain their art or to delve into deeper meanings and deeper truth their art expresses. When asked about meanings they will not give an answer. They will typically say, "What do you see?" They do not understand what they are portraying. Artists usually just pick up on a theme that inspires them. But nevertheless, because of the energy inherent in holy themes artists often find themselves tapping into them. These are powerful, inspiring, and instructive themes of eternal significance. And why are they drawn to them? It is because the theme is inspiring. It expresses beauty. And it rings so true. Whether the work starts out holy or profane, an inspiring lead will often emerge. It will lift up the value of the art as it expresses a beauty or showcases a truth. Good art will satisfy or explain something that lies hidden deep within the soul. Great art often addresses eternal truths. Because that is where the energy and the inspiration is to be found. The poet Keats declared that "beauty is truth, and truth beauty." So prominent works of art, poetry, or song will often bring with them a true and faithful message that is either warning us, or inspiring us, or both. Here below in this YouTube video is a song by Johnny Cash. It is paired with a work of art by Norwegian painter Peter Nicolai Arbo. 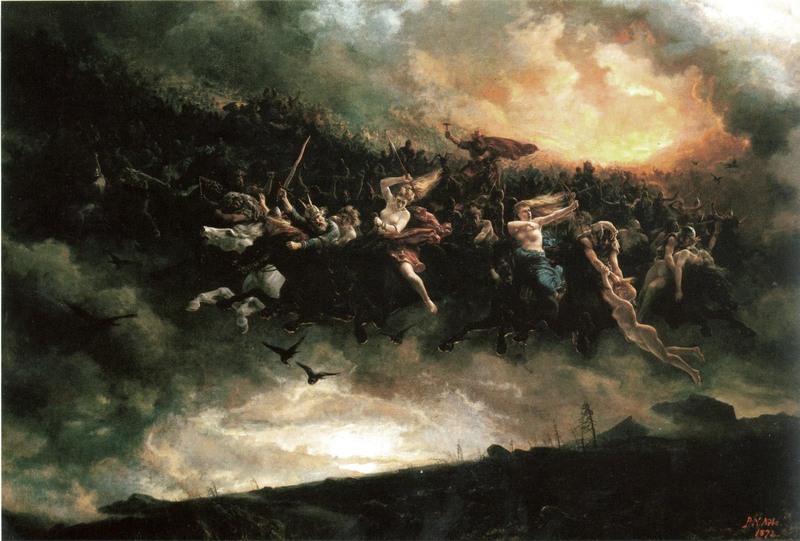 by Norwegian painter Peter Nicolai Arbo, 1872. This specter of the 'Ghost Riders in the Sky' has special application to some of our dominionist churchmen, many of whom who have the spirit of cattlemen, driving their herds by shouted threats and the lash. These are the sort of churchmen who "ride out" in their own strength and "ride" their people across the landscape of time. They become very famous and wealthy as they herd and shoo their people along. Instead of drawing them as a shepherd leads his flock they resort to pushing them along from behind. Oh yes, they become enamored with self-importance as they ride and as they call God's people to ride along with them. But their efforts will all be for naught. As they will discover, this is an impossible dream. It is a job that will never be successful. And once they have begun their ride it will never end. Throughout all eternity those who join these riders will never finish their ride and never arrive at a place of peace and rest. The riders and the hassled sweating people they drive will always be gasping for breath. They will never come into God's shalom. They are supposed to be ministering in the true spirit of Christ. But they have shunned the Way of the Cross. So they will never get to lie down at peace in green pastures. These driving riders and the people that they are herding will be riding on forever. What an awful fate! THE SCRIPTURAL PRETEXT FOR DOMINION THEOLOGY. Dominionists claim we can take over the world for Christ before Messiah returns. But where is the Scriptural authority for advancing such a notion? Those who embrace Dominion Theology base it on a passage in Genesis. that creepeth upon the earth." - (Genesis 1:26 KJV). Of course the idea of "dominion" that they have in mind is a strained and unnatural interpretation of this scripture. Most evangelical Bible students believe that a plain reading of this passage shows God setting forth man's responsibility to exercise faithful husbandry of the earth. God is charging mankind with the responsibility nurturing and caring for the ecosystem He has created. This includes the land and seas with their plants, animals, and fish. Dominion Theology has it own take on the Great Commission. For them it is more than the preaching of the Gospel and the nurturing of new believers in the Holy Scriptures. It is more than promoting the personal walk with God. Dominion Theology gives place to an inner human compulsion for pyramid building. Inherent in this is a desire for control over others. Carnally-minded men seek to increase their power over their fellow man. They want to build their own hierarchies with themselves being installed at the top. Carnal Christians often show themselves quite willing to resort to violence to fulfill their dreams of dominion. They are dead set on achieving "success" in their goals. Have we seen this in Church history before? Oh yes, we certainly have. The Council of Niceae - 325 A.D. 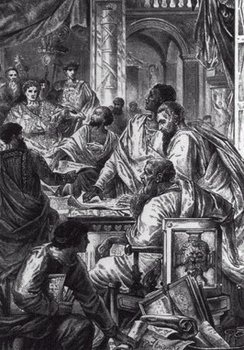 THE DREAM OF DOMINION BEGINS IN EARNEST AT THE COUNCIL OF NICAEA. CONSTANTINE SEND HIS INVITATION AND THE RESPONDING CHURCH ELDERS, AS WANTON GOMER, ARE SEDUCED. THEY GO TO BED WITH THE ROMAN EMPEROR. PAGAN PRIESTS THEN RUSH TO JOIN IN. CHRISTIAN WITNESS IS COMPROMISED. IN THEIR BID FOR DOMINION THE ESTABLISHED CHURCH LOSES THE HOLY SCRIPTURES. WESTERN CHRISTENDOM THEN GOES INTO THE DARK AGES FOR A THOUSAND YEARS. There is an inherent corruption that comes whenever the Church, the people "called out" to be the Holy Congregation of God, forget the way of the cross. When Christians enter into a blood covenant relationship with the princes of this world it gets worse. There is Hell to pay. The Anabaptists finally realized this important truth. Whenever Christian believers embrace the power of the sword it always corrupts the Christian faith. See this YouTube video below. DOMINION THEOLOGY IS A BID FOR WORLDLY POWER. AND THE WAYS OF THIS WORLD ALWAYS LEAD TO COMPROMISE. Simply stated, Dominion Theology is not Biblical. It is not a doctrinal belief that emerges from a careful study of the Holy Scriptures. Typically it emerges in the heady milieu of a wave of success in a nation's economic, political, and military successes. Religious enterprises soon follow this. So in this sense Dominionism is really a form of religious populism or religious nationalism. For the northern ten tribes the situation was tragic. They never returned to the land in sovereign faith, strength, and numbers. Those lost ten tribes are out there still. They are suffering from amnesia and remain lost. Or are they? See these YouTube videos. The sad reality of Dominion Theology is that in order to achieve power and control over other men some sort of accord or treaty must be established with the world system. Biblical Christians of the devotional evangelical variety are fully aware of this danger. They see any bid for power and authority in this world as a very dangerous move. The gathering and the "unity" that is achieved by this means is artificial, cheap, and short-lived. The reason for this is quite simple. Any bid for power is based on compromise with the spirit behind that power. Dominionism is achieved by playing games with the systems of this world. And when they use the ways of this world to establish authority the Church that becomes established finally ends up running counter to true Christianity. It is a deception, even a seduction. The Church is "sleeping with the enemy". It is an impossible dream. The crusades were a classic case in point. Whenever we see the Church departing from the pathway of Christian grace to embrace the sword it is an ominous sign. Because at that very point the glory of God is departing. And the Presence of God, the foundation of any true national greatness, is already heading out the gate. To see the Christian Church compromise the faith is a very sad thing to see. They do this in order to gain "pull" with the temporal political power. Christian Dominionists are quite determined to do this. They will do a lot of terrible things to fulfill their dream to dominate the world. The cycle of events is quite common. A nation begins to realize great blessings from God. This is when dominionists arise. Call it the "deceitfulness of riches" or call it "religious jingoism" this high minded controlling spirit is suddenly front and center. Dominionists are bound and determined to make a lunge for power. This aggressive power hungry spirit is foreign to true Christianity. The Dominionist spirit and Dominion Theology does not have a foundation in the Gospel. But militant Christianity takes up the sword anyway. And why? They will say that the sword is to be used to advance the Kingdom of God. Dominion Theology does not really belong in the church. It crosses over from national and international politics. Or it may come from the prosperous merchant world that burgeons up inside a nation when it comes to be a superpower. At that point Dominionist dreams and a 'Kingdom Now gains enters the church and begins to infiltrate churchianity. The spirit of national dominion is highly seductive and intrusive. It infiltrates the Christian Church holding sway in the land. Dominion theology, a resurgent Crusader spirit, seduces and eventually dominates church leadership. Then it proceeds to set up shop inside the church. The Church, and the true faith that was first delivered to the saints, is then "re-engineered". This is so sad to see. Gospel outreach and overseas missions are often neglected. The Great Commission is sidelined in favor of the new political agenda. Christian offerings, funding that should be going to missions and the Gospel outreach is used to pay politicians, fund-raisers, lobbyists, and lawyers. The church attempts to buy favor with government officials. She tries to extract promises of consideration in governmental affairs. Dominion Theology is very persuasive and quite successful in seducing nominal Christians. Traditional evangelical endeavors are sidelined in favor of motivational hype and political action programs. Christians who do not embrace the Way of the cross, the evangelistic Gospel, and missionary outreach abroad can be very easily drawn into these down-home pre-occupations. Dominion Theology appeals to those who believe that the nation's woes can be solved when "good Christian men" "rise up" and "take control. People like militant "take charge", even Crusading type Christians. They flock to these Dominionist leaders in droves to get whipped along and tongue lashed every week at church. Christians caught up in this militant Nicolaitan Christianity slowly lose their peace. And as they are driven along they do not realize just how far they have strayed from the peace that comes in the true calling of Christ. A NEW MILITANCY IS ARISING IN THE AMERICAN CHURCHES. THE DOMINION THEOLOGY WE SEE IN AMERICA TODAY. SEE THIS STARTLING BUT REVEALING YOUTUBE VIDEO! Dominion Theology is not a child of the Bible. Nor is it spawned in the seminaries for that matter. It slips into the Church from the world. Political and economic realities are mixed in with this as well. The church is wowed with special political rallies, loud music, and a drumbeat for concerted political action. The new optimistic politico-religious mindset for world takeover is presented as the main option. It is phallic in spirit, energizing the lower carnal nature of man. Dominion Theology brings with it a new aggressiveness and pugnacity. This changes the character of the church. True worship and reverence for the Holy Scriptures takes a back seat to politics. And the Gospel, missions, and the devotion to the true Spirit of Christ suffers. The crusading warrior monk is now being lionized in the popular culture. 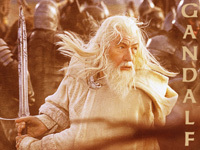 This is Gandalf, a heroic leader in the Tolkien allegory "Lord of the Rings"
Dominion Theology can be brutish. It always was a forceful militant sort of Christianity. Dominionism embraces the methods of worldly power, including the use of the sword and the gun. It is not new. It is the same sort of "crusader mindset" that was seen 900 years ago. When Pope Urban preached the First Crusade the whole of Christendom began to rise up in Edomite anger. The crusaders were, in fact, Christian Dominionists. Some evangelicals would doubt that they were really 'Christian' at all. Most people, unfortunately, do not know the difference. After the crusades, came the Spanish Inquisition, the Saint Bartholomew's Day Massacre in France, the Pogroms of eastern Europe, and the Holocaust. Unfortunately they have left a bloody legacy. Most Jewish authorities believe to this day that all Christians are capable of bloody mayhem and anti-Semitism. This is not true of Bible believing Pilgrim Christians. But sadly, these shameful events keep recurring in Christendom, (so-called). They happen whenever economic conditions deteriorate and the superpower of the day rises up in anger. As Dominionists the crusaders were a very diligent lot. They were fully committed to their task. After selling their lands, entrusting their funds to the international banking system of the Knights Templar, and locking up their wives in chastity belts they strapped on their sword and headed out. They began in Europe by killing "Jewish infidels" in their own home towns. Why did they start their crusade by slaughtering their Jewish neighbors? Their thinking went along these lines. Why come back from a crusade to find that the "infidel" Jews owned the land and had taken their wives? 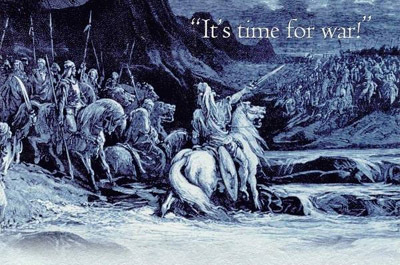 "Good Christian men" headed off on the crusades in a high state of religious excitement . The first crusade was not a governmental thing. It was preached into existence by Pope Urban. The spirit of Dominion Theology arose from inside the Church. This was a disaster for Christendom. The Crusades were shameful, bloody, and tragic affairs. They destroyed any hope of true Christian witness. 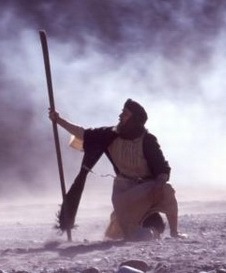 The cross of Christ was whisked away. It was magically transformed into the Excalibur, the "sacred" sword of the crusaders. So what was actually achieved for the cause of Christ by the crusades?
. . . . . The answer is, 'precious little'. DOMINION THEOLOGY AND REPLACEMENT THEOLOGY. HISTORY SHOWS US A VERY CLEAR CAUSE AND EFFECT. BAD THEOLOGY LEADS TO BAD BEHAVIOR IN THE CHURCH. 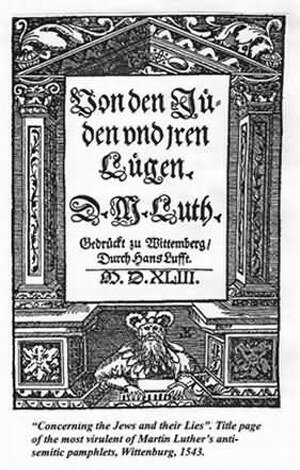 The antisemitic pamphlet by Martin Luther. Within the ranks of the modern Dominion Theology movement are those who embrace "Replacement Theology". This is a point of some real concern. This Biblically unfounded doctrine affirms that "God has finished with the Jews". According to Dominion Theology, the Christian Church, as it now exists, is now the institution and engine of history. The Church is going to take over the world and thus bring in the Kingdom of God, (or so they say). The millennium of the Church is in the here and now. This present era of the Church is the only millennium this world is going to see, (so they say). Replacement theology ignores what God is doing in and through Israel today. Some evangelicals are concerned that, is the thin edge of a wedge. They say that it could re-ignite another round of anti-Semitism in Christendom. Anti-Semitism was seen in the former nationalist movements of other nations in western civilization. It rose up when they came into their time of power, (and arrogance), as the superpower. Even the British, whose evangelicals had originally called for a homeland for the Jews in the Balfour declaration of 1917 double crossed them in 1947. The British military actually prevented Jewish refugees, survivors of the holocaust, from making Aliyah. They stopped them from returning home to Israel. In one incident a British cruiser turned back a shipload of Refugees. The warship actually fired on and boarded the unarmed vessel killing many innocents including Jewish women and children. In this historical overview of Dominion Theology we shall now take an excursion back 100 years into the golden years of the British Empire. This history provides an excellent opportunity to see what Dominion Theology does to a nation when it becomes the superpower and how it affects the national church at home that becomes party to this spirit. The late 19th Century saw Great Britain approach the peak of world power. This was the heyday of the Victorian era. The British Empire owned one quarter of the globe. It looked like it might well be poised to take over the whole planet. 1897 was the year of Queen Victoria’s "Diamond Jubilee". It was an occasion for much celebration throughout the British Empire. At that time one of Britain’s best-loved poets, Rudyard Kipling struck a somber note. He wrote 'Recessional'. This was a poem that turned out to be strikingly prophetic for the English speaking people. The 20th Century was about to dawn. And out across the horizon were seen the portents of momentous future events. As usual, the artists were the first to become aware of this. Lest we forget, lest we forget!" The Edwardian age was a heady time. The British Empire was at the peak of its power. British colonies and dominions covered fully one quarter of the globe. Many British colonialists had become fabulously wealthy. The Edwardians of those pre-war years were the 'yuppies' in that era of British world dominance. Under the spell of men like Cecil Rhodes they believed that total global dominion under their Christian British Empire was just within their grasp. Was this a likely historical outcome? And for Christians of the British Empire was this concept of Dominion Theology scripturally founded? Did the Bible give them any reason to go along with this? It did not. But that didn't matter. There was a grand national party going on! Politics, power, patriotism, wealth, powerful friends, slaps on the back.... And the international bankers were there. Certainly this was an auspicious time. Who would want to interrupt all that with a call for a Bible study on the Millennium or on the Seventy Weeks of Daniel or the future second coming of MessiahBozrah Deliverance during the Second Coming of Messiah? How would it be if you were the vicar in those heady days of the British Empire and you were invited to the colonial party? How would you respond to all this peer pressure by peers of the realm? Would you want to rain on their parade? This was a powerful and happy crowd. What churchman in his right mind would want to offend or walk away from such bright and prosperous company? These were people with such fabulous dreams of world dominion. Who would want to warn them of the error of their way of thinking? And what if a churchman did warn them? Just how long would such a vicar retain his tenure or his parish appointment? Church and state were joined at the hip. The cleric who offended the aristocracy or the gentry would soon Live to regret it. He would be thrown out on his ear. The English ecclesiastical establishment of the time were under pressure, (as usual). They had to toe the line. For Christian leaders who knew the scriptures it was a problem of conscience. But those placed in positions or religious authority knew that to retain their privileged position they had to compromise. They and go along with the program, -	or resign. Of course these were intelligent and discerning men. They knew which side their bread was buttered on. And so most of them were happy to agree. They would go along with this British national vision for the future. They would sign on with this British national and church agenda for world dominion. It was a politically inspired dream to be sure. Many churchmen were drawn in by the prospect of all the power and the wealth that would come when this dream began to manifest. So they fancied this idea of a global church takeover. Could it be true? Well, it certainly would be nice! The Edwardian age in the early 20th century was an intoxicating time of celebration of wealth and power in England. This was not all related to the clinking of glasses at British parties of the rich and famous. Nor was it the brandy imbibed in those smoke filled rooms. The English Church was getting heady and high minded as well. During this season of patriotic fervor a new eschatological doctrine began to emerge. Optimistic British Imperialism had crossed over into English religion. It would become theologically expressed as a new global dominion theology. This was the doctrine of dominion theology. Its eschatology or doctrine of the end of the age was expressed as 'post-millennialism'. The popular belief was simply this. The British Empire had arrived! This new British era was about to wrap up history. The Brits would be the ones to bring in the grand climax of the age. They would deliver up the "Christian Millennium". They would wrap it up on behalf of Messiah. Then, (if need be, if He should return that is, they would hand it over to Him. This was the British version of Dominion Theology as it emerged 100 years ago. This was a subtle play. The End Time scriptures were given the “silent treatment”. Whether or not Christ even needed to bother to return or not was no longer such a big issue. To please the evangelical Christians the churchmen would vaguely allude to the idea that Christ "might come” at some vague future time. But to please the Gnostic pagans and the British traditionalists they would suggest that Christ could jolly well stay up in the heavenly realm. He was hardly needed down in this cosmos at all. The eschatological smokescreen was a church policy of convenience. Whether or not there would be a second coming of Christ didn't really matter. There were no Bible readings of the second coming in the liturgy of the Church of England. So to the English clergy it was a non-issue. Because they and the British Empire would wrap up history both for God and for king. They would finish the job! To these people the Millennium was not a literal future thousand years under Messiah as described by the Apostle John in Revelation 20. For them the Kingdom of Christ was in every sense an earthly, yet spiritual kingdom, in the here and now. To these amillennialist, (or now post-millennialist), people the Millennium of Messiah was nothing more than the "Age of the Church". According to their thinking, the Millennium/Kingdom was destined to be completed victoriously and perfectly in their age. And this "Christianization" would be done by the Church through the auspices and under the guns of the British Empire. Of course there was no scriptural foundation for such a notion or for any sort of Dominion Theology for that matter. No such eschatology could be found written in their Bibles. "But what did it matter", they would counter. "At least it was a 'truism'". And as the British celebration went on more and more people were drawn in to this. Politically and socially it became very popular. So as a matter of political expediency and as a matter of pragmatism this post-millennialist Dominion theology started to become the norm in British Christendom. It came into the national Church with the power politics, (and the politeness), of the time. It is a sad fact of history that Church-state realities all too often drown out the still small voice of biblical truth. If the Bible was saying something different to what the spirit of the age or national rulers and the people wanted to hear then something had to give. Unfortunately it was the Bible that was pushed aside. The authority of the Holy Scriptures was made subservient To the political needs of the nation. This is the awful truth about Dominion Theology. But it is demonstrated in history time and time again. The average churchman, as usual, went along with the crowd. They simply would not "rock the boat". They would let the matter 'ride'. Of course they were very busy. They were not inclined to spend too much time checking out their sermons with a careful study of the Holy Scriptures. Post Millennialism and Dominion Theology were both, in fact, erroneous interlinking doctrines. But as long as they were "politically correct" then what did it matter? If the king and the crowds believed it and as long as they were happy with it then who cared? There is no question that their post-millennialist doctrine of a New Christian Millennium under the British Empire was unsupported by Scripture. It was, in fact, a Utopian dream. Dominion theology had crept into the national psyche. Many of the British traditionalists were rolling in money. They were drunk with power. These were a people who were, (at least in their own minds), about to take world dominion. This is how the dominion theology and the notion of the "Kingdom Now" began nestling itself into the English Church at the beginning of the 20th century. Dominion Theology came into the British Church insidiously. And it sneaked in when the British Empire was at the peak of its power. Here is the big question. Is this starting to happen in the American Church today? Could this same politico-religious history repeat itself in America? RUMBLINGS OF DOMINION THEOLOGY IN AMERICA. The risk of this happening is very real. Reconstructionism has been around in the older denominations of America for some years now. 'Christianity Today' magazine reports that Reconstructionists has been quietly linking up with the "Kingdom Now" or 'Latter Rain' movement emerging amongst the New Charismatics. Does the post-modern church care about checking into these issues? Unfortunately the answer is no. Most Christian believers in the western church today do not make it a priority to study the scriptures. Todays Christians are inclined to say, "Whatever!" and go along with the crowd. They are not studying to show themselves approved unto God. And they are not hearing what the Holy Spirit is saying to them. All too often their charismatic leaders access just single verses of scripture only to put their own personal "human potential" spin on them. This "sells" very well in our narcissistic society. The "human potential" movement has taken over the mega churches. And the book "Think and grow rich" by Napoleon Hill is the new bible for many Christians in the "positive confession" cult. The catch phrases, "name it, and claim it" has brought another "cargo cult" to middle America. The "personal power" movement in the church and the culture at large is the same Dominion Theology we have seen in the nations but conducted at a personal level. This is so sad to see. The charismatic movement today has been hi-jacked by this phallic and carnal sort of pseudo-christianity. The Charismatic movement that was once so wonderful is loosing the anointing it once had. It has lost its integrity. Back in the 70's it was a welcome fresh breeze of the Holy Spirit. And it brought some wonderful renewal to the western Church. Alas, todays Charismatic movement is fading away. It has been bought out by the powers of Mammon. So what is actually happening in the American Church and culture? There is good evidence that this postmillennialist mindset has already begun to quietly install in the American Church. The Trojan horse this time is the 'latter rain' 'prophetic movement'. And its Dominion Theology is now being widely and enthusiastically received. The Latter Rain movement was condemned as heresy by the Assemblies of God back in the early 1950's. Are the Americans familiar with this history? How about the history of post-millennialism and Dominion Theology in Great Britain at the turn of the 20th century? As we have seen, the British embraced this post-millennialist dominion fantasy. 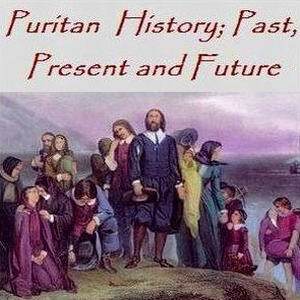 Do American Christians know what happened to the British afterwards? GREAT BRITAIN'S DALLIANCE WITH DOMINION THEOLOGY. AND THE SAD HISTORY THAT RESULTED FROM IT. the quick and the dead". These were the words the ANZAC's remembered at Gallipoli. The awful Great War had just come to its bloody end. The words of warning also come back to us in Rudyard Kipling's poem. They remind us of 'solemn things', even eternal things. Jingoism is an intoxicating politico-religious potion. During those Edwardian years many English Christians joined in with the colonial "old boy" clubs. The clerics were there as well, all celebrating at the same party. The party was in full roar in the British Empire and the established Church-state system was there as well. There they were singing "Rule Brittannia" as they lifted up their glasses, toasting themselves as the victors. And why wouldn't they? Surely any red blooded Englishman would want to join in? They would want to get into the spirit of things and join this national victory celebration, eh what? Most did. But some, like Rudyard Kipling, were not so sure about all this. They sensed bravado and they were leery of the jingoism in the air. They sensed the danger of this explosion of national pride. But few dared to voice any words of warning. Evangelicals were people who read their Bibles. They knew better. They had information from beyond what they were seeing in the nation. Many were were a bit concerned over what was being said. But English Christians for the most part were comfortable with the dominionist national party and its patriotic spirit. Many believed what they were being told about a global takeover by Great Britain. They believed that they were on the threshold of their dream. World dominion under the British Empire was just within their grasp. It was just a few short years away. They felt that they were on the verge of wrapping things up worldwide for 'God and King'. Why not just bundle up the entire planet?! What were they thinking? Did they really imagine that the history of this age would be wrapped up by the British Empire? And how about their Church of England? Did they imagine that the Archbishop of Canterbury would just hand the world over to the returning Christ as He came sauntering back to reclaim this world? Did they imagine that Jesus would make a special guest appearance at Canterbury Cathedral to take part in their royal and ecclesiastical processions and proceedings? Would Christ hand out the awards to the British king and his nobles and renew the tenures of all their victorious overcoming church leaders? Just what were they thinking? Unfortunately for the British, their plans for global dominion were not to be realized. Their reveries would fade away. And their post-millennialist eschatology with its Dominion Theology based upon the global dominion of the British Empire was about to take a tumble as well. The heady fantasy of post-millennialism would simply disappear from the scene. Dominion Theology under the British would fail, just as it did for the nations that preceded it. Dominionism was destined to slip, slide, and stagger down the chute into the dustbin of history. The Edwardian years of the early 20th century were times of great national pretension and vainglory. But they were significant for another reason as well. This just happened to be the very same time period in which another great nation in Christendom was coming onto the stage of history. The Germans, masters of the modern industrial age, were beginning to rise up in Europe. But that was not all. It was during that same era of ostentatious British materialism that something else was about to unfold. It was a sad event that would affect Great Britain and America very deeply. BRITISH DOMINIONISM BOASTS AGAINST GOD ALMIGHTY. "NOT EVEN GOD HIMSELF COULD SINK HER!" 2:30 a.m. and the great liner Titanic goes down. Two thirds of the ship's company perishes. In April of 1912 that 'unsinkable' emblem of the British Empire, R.M.S. Titanic, sailed out of Southampton. It had been said, "Not even God Himself could sink her!" Upon hearing that some passengers cancelled their plans and had their tickets refunded. This was truly an ominous moment in history. The great Britannia who ruled the waves had come to the peak of her power. She had also come to the peak of her national pride and hubris. At that time the giddy British church-state celebration was in full roar. But as the RMS Titanic headed out on her maiden voyage all that was destined to change. The nation was ripe for judgment. And the grand British party was about to come to an end. It was close to midnight on April 15th when the iceberg loomed up ahead. The officers of the watch were not well prepared. The binoculars, by a serious omission, had been left back at Southampton. The watch peered into the darkness ahead. But the iceberg was difficult to make out on this dark and moonless night. Finally, they saw it. The order went down to the engine room to reverse engines and steer 'hard a port'. But the great ship was was too close. She was unable to steer clear. The ensuing collision with the iceberg was hardly felt by those on board. But the damage beneath the waterline was devastating. 200 feet of the ship's hull was buckled and opened to the sea. 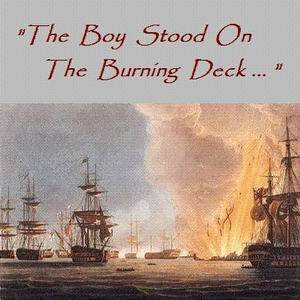 Shortly after midnight the ship's officers made their report to Captain Smith. The compartment doors had all been closed. All the pumps were working. The crew was doing everything possible to stop the vessel from sinking. But as the extent of the damage became clear there could be no doubt about the outcome. Captain Smith and his officers soon came to an awful realization. The loss of the "Titanic" was a great tragedy. Two thirds of the ships company perished in the freezing waters. Many saw this as a stern warning to the nation from God. The loss of the Titanic was just the beginning of Great Britain's troubles. Two years later saw the outbreak of World War 1. A generation of young British men were over in France hunkered down in the trenches. There they were in the mud and the rain. The awful barrages of artillery left many shell-shocked. For four long years they faced the barbed wire, pinned down by the merciless sweep of German machine guns. This was Europe's first experience with mechanized warfare. The human losses the British Empire suffered in the Great War were beyond belief. This turned out to be the beginning of the end for the British Empire. The British would not be the nation to wrap up world history after all. Nor would their national church be wrapping up the world for Christ. During World War 1 Dominion Theology melted away. It sneaked out through the back window of the English Church. It slipped out just as it furtively as it had slipped in. In November 11, of 1918, at the 11th minute, of the 11th hour the guns fell silent. As the war ended the bells tolled and the soldiers came home. The returning soldiers were sober and wiser. But many would not be returning. The flower of British and British Commonwealth youth would not be coming home. They lay silent on the Somme, at Verdun, and in Flanders Fields. Do the British have a history lesson to pass on? Do they have something to tell their American cousins across the pond? The Victorian Age was a glorious time in British history. But now it is is over. The great British Empire has come and gone. 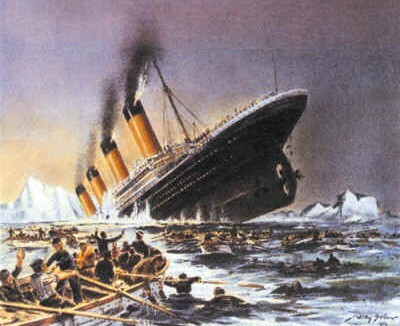 We also remember the Titanic. Many believe that it was a warning from God. 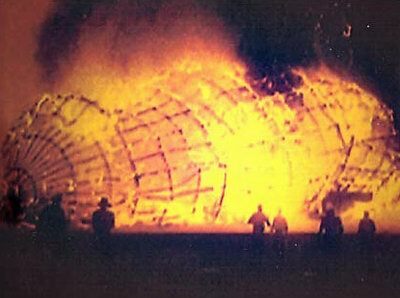 The German Zeppelin Hindenburg catches fire. The great airship is consumed in 30 seconds. We also remember the Hindenburg. This great airship was built in the 1930's. At that time it was the pride of Germany. The Hindenburg was the largest of her fleet of Zeppelins. In May of 1937 the great airship was coming into its mooring after a trans-Atlantic crossing from Europe. A spark ignited the hydrogen within the ship and it quickly caught fire. The horrific conflagration that resulted shocked the world. The Hindenburg was totally destroyed. In just 30 seconds it was burned to just a skeleton and ashes. This terrible tragedy happened as the German nation was approaching the peak of her power. Germany was on the rise. She was about to make her bid for global supremacy. As the superpower of western civilization Germany would bring order to Christendom. Unfortunately it turned out to be a spotted record. Germany, the cradle of the Reformation, was drawn away from true Christianity and into national tragedy. The fiery loss of the Hindenburg came just two years before the outbreak of World War 2. It was an awful catastrophe. Was it also a warning to the German nation from God? As people with roots in Western Europe we consider ourselves citizens of "Christian" nations. Even Adolph Hitler presented himself as a champion of 'Christian values'. Western Europe was once referred to as 'Christendom'. But how real is our allegiance to God? Do we stop to consider the One who came among us us as our Redeemer? Do we believe His promise that he would return as Messiah as this age comes to its tumultuous climax? THE NEW WORLD COMES TO THE ARENA OF GLOBAL POWER. As English speaking people we have been greatly blessed. The hand of Providence has brought us untold wealth. But first and foremost we were supposed to remember the One to whom we have been called. We were a "called out" people, an "ekklesia", a congregation, a covenant people under God. We were not "called out" to merely serve "King and country". Nor were we "called out” to be playboys personally obsessed with "our own business" and the "pursuit of happiness". We were commissioned to act for God as well as for country. Our role of leadership among the nations was not to be undertaken lightly. We were not to dishonor our God by acting out of our own self-interest. Nor were we to become obsessed with Mammon and to spend our lives heaping up to ourselves those material blessings the God of Israel brought our way. Mismanaged power and prosperity can bring men and nations into great peril. God has given us many warnings concerning national pride. Alas, these warnings have gone unheeded. Oh yes, we rail against the immorality and the evils of our age. And we pride ourselves on setting up our programs based on our own socially and even religiously engineered set of "core values". But how much have we committed ourselves to the personal real time indwelling authority of Jesus Christ? He is the One who is going to make the difference in the real strength and the integrity of the nation. And how much do we depend upon the leading of His Holy Spirit? This was the message in that wonderful and yet unappreciated movie Time Changer. Both America and Great Britain and the nations of the British Commonwealth have been especially forgetful when it comes to the things of God. AND THEN THE LOSS OF THE CHALLENGER, AND COLUMBIA. Two world wars have now passed. The Germans have been defeated. And the Japanese as well. The famous British 'sea power' is now passe'. It has given way to American air power and nuclear power. Two atom bombs dropped over Japan in 1945 punctuated the transition. And the American eagle has landed on the moon. was the first time NASA had ever lost a crew. It seems that America too may have been given warnings from on high. In 1987 the space Shuttle Challenger blew up shortly after launch. 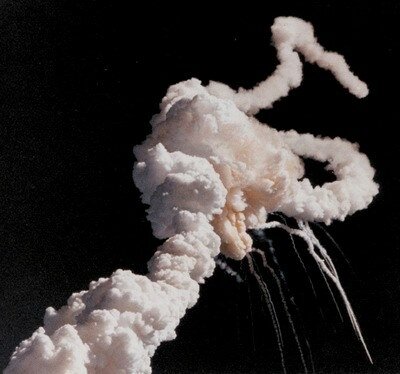 The loss of the Challenger was a great shock to the American nation. This was followed in more recent times by the loss of the Columbia during re-entry. What was happening? Was America going the way of the other nations? Was the great superpower getting a similar warning from God? The Pax Americana is here. It is now well established. American military forces now occupy the cradle of civilization. 150,000 American troops are stationed along the Euphrates River. This happens to be the northern border of the land promised to the children of Abraham. (Gen.15:18) The nations are raging. (Psalm 2) There is a Clash of Civilizations. And after 911 the Third Jihad is now in full swing. Epic world history is now about to unfold even as U.S. military forces are camped by the rivers of Babylon. Meanwhile, American oil companies are very busy. They are drilling for oil on both sides of the Caspian Sea. These are the southern reaches of the former USSR. The American eagle now patrols the Caucasus Mountains out at the gates of Gog. The Russians are furious. These are dangerous times we live in. The Russians have just sold the Syrians 250 sophisticated surface missiles. Each is capable of sending a 1,000 lb. payload, nuclear or otherwise, 250 miles. These are a far cry from the primitive "Scud" missiles we saw in the Gulf War that failed to launch or failed to land within many miles of their target. These missiles are GPS guided. They can put a warhead within 20 meters of the co-ordinates dialed in for the target. As if this isn't enough Syria has just hosted a meeting if Hezbollah, Hamas, PLO and Iranian interests. Their meeting place? Damascus! The city is strategically located for missile launching. It is right near the northeastern borders of Israel. The city of Damascus is perhaps the oldest city in the world. As this map of the fertile crescent shows, it was there when Abraham headed south to the promised land from Haran. It has never been destroyed. Yet the prophet Isaiah has predicted that the city of Damascus will at some point become a 'heap of rubble. (Isa.17) Do we know what all this means? AMERICA TAKES POSSESSION OF BABYLON AND THE EUPHRATES RIVER. ANCIENT ECHOES, LESSONS, AND MESSAGES FROM THE GOD OF ISRAEL. Way back at the beginning, God, through Moses, gave His covenant people many promises of national blessing. But He also warned them not to take the blessings He brought to them lightly. All of the Judeo-Christian people are being called to pay attention here. And we in Christendom have a spiritual responsibility before God. We cannot dodge it or belittle it. This is especially important as America comes into prominence. It has been said that America is the “last remaining" superpower. Whether she realizes it or not, America must be the guiding light of western Christendom for this period of history. She cannot deny this. Nor can she avoid her calling before Yehoveh/God. America, needs to take her responsibilities seriously and in humility before God. The last great Christian superpower, (and all of Christendom for that matter), needs to remember their God. We all need to own up to the covenant we have with the God of Abraham, Isaac, and Jacob. The English speaking people have been truly blessed. America is now the nation which has the international political stage. She also has the military might to go with it. The American military is in the Middle East. She has military bases strung out from Turkey, on through Iraq, and beyond to Afghanistan and India. We live in interesting times. The west has returned to the cradle of civilization. Not even the British got into this high stakes area of the Euphrates valley, the area of the four angels. (Rev 7:1) U.S. forces are now patrolling the region. They pass by the ancient ruins of Ur. This was the city where Abraham first heard from Yehoveh/God. He left for Haran and then sojourned on to the land of Canaan. The people of faith, the children of Abraham, are on a pilgrimage towards "a city not made with hands". 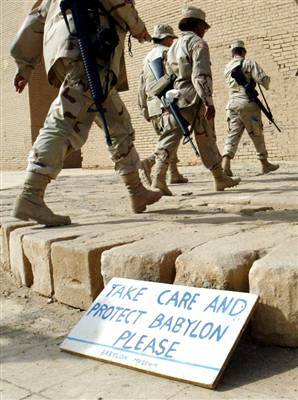 American soldiers are now encamped at the ancient city of Babylon 50 miles south of Baghdad. Babylon was the first city built by an exuberant mankind after the flood. It was the city established by Nimrod. (Gen.10:10) It has been rebuilt in part by Saddam Hussein. Babylon is now used by allied military forces. This world has now become a very dangerous place. Israel is now back in the land. The principalities and powers know what this means. The nations are raging. (Psalm 2) Rogue nations espousing virulent anti-Semitism are arming themselves. Syria is now taking delivery of 24 accurate GPS guided Russian missiles capable of reaching Israel and the major cities of Europe. And 2,000 nuclear warheads have gone missing from the Ukraine after the breakup of the Soviet Union. They may have made there way to Iran. The Iranians/Persians have become very belligerent of late. The Iranians, (Persians), want to sell their oil to the Europeans for Euros. See this article. (That might be something that can be negotiated). Unfortunately for them they and have also vowed to destroy Israel. (They do not seem to be very negotiable on that point). Someone has to take some sort of international responsibility here. And who will do that? The French? Should we just withdraw as liberals have suggested. Should we just let the world go to hell in a hand basket and go back to watching the football game and depraved sitcoms? Or are we waiting for Communist Chinese dragon to rise up and take charge? Which will it be? Whether we like it or not, America is now the bastion of Christendom. She is far from perfect. But she is the lesser of many evils. Let us pray that wisdom and restraint will prevail. The role of the superpower is to ensure freedom and justice in world trade and to provide peace and security in the world. A Christian superpower will provide tax breaks and a time of relative peace in the world. This enables Christian missions to go forward. America is the most prosperous nation ever seen in all of human history. We were not to abuse the blessings and the power that came with all this wealth. Nor were we to be corrupted by our blessings. In the pages of the Bible we read about the many warnings given by the prophets to the nation of Israel. We have been exhorted to keep in close communion with our God. He is the same Deity. God Almighty is the Holy One of Israel. He is the Sovereign God who overrules in all of history. He presides over everything that goes on in this cosmos. He is just and righteous in everything that He does. And He expects us to keep in close contact with Him. He is the One who sets rulers in place. He determines their years in power and their time under the sun. And He is the One who brings them down again. American history is now world history. And both histories are now coming to some sort of a climax. The nations are raging against the little nation of Israel. Why is this so? The principalities and angelic powers who are rulers over nations are in a tizzy. They are in an irrational rage. What is vexing then so? Could it be that they are dreading the final witness of the saints, and the Second Coming of Christ, Israel's promised Messiah? Quite clearly we are on approach to some sort of a grand climax. History is not just the dry sleep inducing information found in dusty old textbooks. Holy history, or what our German friends call "Heils geschicter" or "salvation history" is far from boring. It is full of life. No Ritalin required here! And this holy history has now come knocking at our door. Through it all, God’s Word of warning thunders down through three and a half thousand years of history. The Holy One of Israel is still speaking to His Judeo-Christian people. The western nations are a company that was once known as "Christendom". But we are a generation who have lately become rather heady and high-minded. We, as English speaking people, have forgotten our God. The consequences of this are serious. God warned the British in 1912 when the Titanic went down. He warned the Germans in 1937 when the Hindenburg went down. And He warned the Americans when the Challenger went down in recent years. All these warnings came as the nation came to the peak of their power. We have been repeatedly warned, 'lest we forget'. Here is God’s message given through Moses to His covenant people. It was spoken way back at the beginning of our journeys. This message is for us today. that you shall surely perish"
We serve a God who writes the Book of Life. He is God Almighty, the Sovereign One who oversees history. "The nations are as a drop in the bucket. The poet Rudyard Kipling admonished us that the nations are forgetful. When they come to the peak of their power they do not remember their God. They forget the ancient paths. And so they lose their way. He wrote the poem 'Recessional' for us, 'lest we forget'. Should we not then pause in our busy-ness to remember Our God?